Because each ring is handcrafted to order, all payments must be made in full before work on your one-of-a-kind ring can begin. All payments made through this site are processed securely. Because each ring is a custom commissioned piece we do not offer refunds. Each ring is handcrafted from raw materials and is custom made to order just for you! Because of this, we do require a 6 weeks lead time to produce your ring if it is a titanium-only ring and 8 weeks for any other metal (silver, black zirconium, Damascus steel, or gold). Please keep in mind that if you order a ring engraving or ring box engraving it may add up to a week to your ship date. If this time frame will not work for you, we do offer a rush service, which moves your order ahead in the make line and gets it to you sooner! We also have a page of in-stock rings which are ready to ship within 2 weeks. 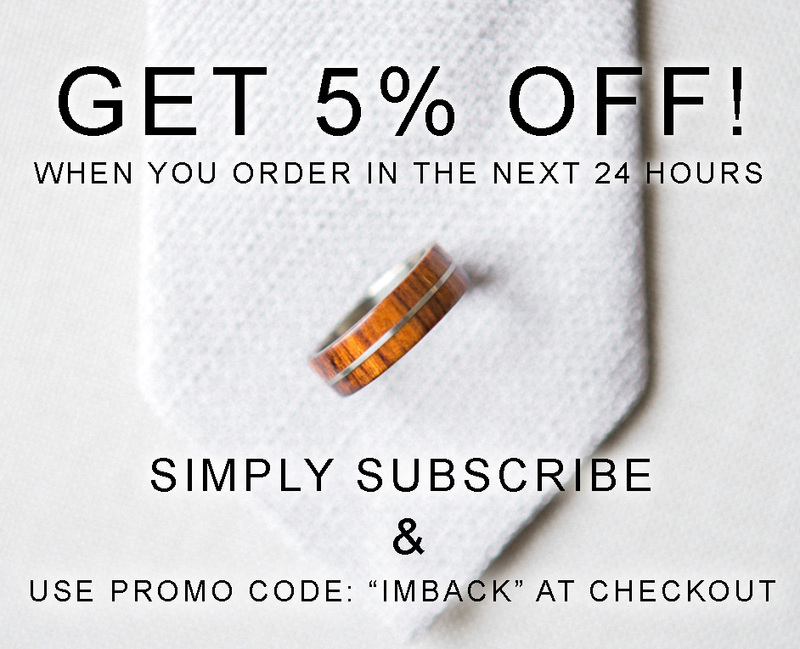 Shipping for rings is USPS 3-5 day (US only), and expedited shipping is available at checkout for an additional cost. Because we cannot control the actual shipping process, we are not responsible or liable for any shipping delays. Because of this, we cannot guarantee that a ring will arrive on a specific date, but we can guarantee it will ship in time to arrive by the date needed. International shipping is available during the checkout process. Please be advised that shipping to your country may incur a tax or custom charge upon receiving the ring, which you will be responsible to pay for. We have no way of knowing what that amount will be or if there will even be one. It is also illegal for us to mark rings as gifts to avoid this tax. Please note that we do NOT send our packages signature confirmed. If you would like us to add this service to your package we're happy to do that, please just let us know!  Contact information: Name, email address, phone number and shipping address.  Billing information: Credit card billing address and credit card details.  Our corporate partners to facilitate the co-branded or joint services (such as customer service or shipping) that are required to complete an order. We have always strived to deal with the customer information in a very safe and secure manner by following industry accepted technological methodologies. As most of our customers use this shopping cart to make purchases, the information provided by them during the trade is secured using Socket Layer Technology, or SSL. This technology helps us to secure your private information from hackers and also ensures that all data entered on our website is transferred through our secured payment gateway, which provides the complex infrastructure and security necessary to ensure secure, fast and reliable transactions. As you browse stagheaddesigns.com advertising cookies will be placed on your computer so that we can understand what you are interested in. Our display advertising partner, AdRoll, then enables us to present you with retargeting advertising on other sites based on your previous interaction with stagheaddesigns.com. The techniques our partners employ do not collect personal information such as your name, email address, postal address or telephone number. You can visit this page to opt out of AdRoll and their partners’ targeted advertising.